Two of the studies done at Occupy London that I was happiest with. 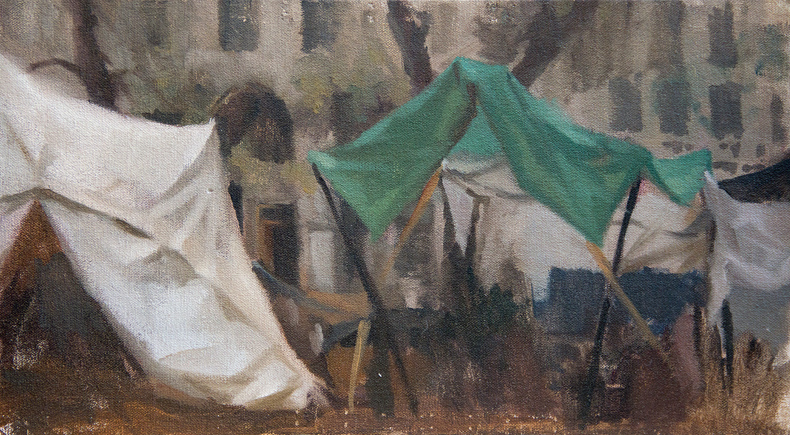 Over Oct-Nov, I was working on plein air studies at the Occupy London sites over at St Paul's and Finsbury Square. It was... quite something- on one hand, having to paint with ALL of Square Mile and Central London converging down Temple Bar during lunch hour was... an interesting experience. 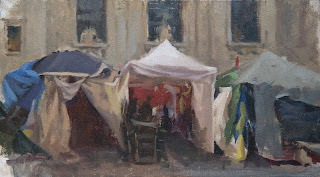 Also, tents! And protesters! Many studies were lost because they were either: 1) keyed incorrectly (i.e. 'fruit salad and garish tents syndrome'), 2) have bad drawing, or 3) even badder composition (sad trombone sound). Around this time, I was researching on Russian painters of the Wanderers School, and was trying to assimilate and understand what went on in their sketches and studies (boss things, inevitably). James Gurney in his book, Colour and Light: A Guide to the Realist Painter wrote on the advantages of working in overcast lighting outdoors (you see local colours of objects effectively without that annoying solar glare, sparkling, silvery light and sometimes uncertain weather conditions of this 'outdoors' thing). Using a more restricted and subdued pallette also helps (in these, I premixed a 'not-so-neutral grey' pile using Ultramarine, Trans. Oxide Red and white to neutralise more chromatic colours, and made sure that my darkest darks are still pretty chromatic (they're a mixture of the ultramarine, alizarin, and oxide red in varying amounts according to how cool or warm I want the darks to be). Spending more time on accurately drawing and assessing the shapes that I was applying was very crucial, as was taking the time to look closely and be as broad in terms of application of paint as possible (no small detail brushes just yet!). It was partly thanks to many failed past sessions at the site that these studies were working out okay. It is a mistake to make pictures too soon. The nearest a student is likely to to a picture is a careful study, and he will be as successful with this, if he makes it for the study of it... Imitation is the highest art; but the highest art requires the ability to imitate as a mere power of representation. The mind must not be hampered in its expression by a lack of knowledge and control of materials, and the painter who is constantly occupied with the problems he should have worked out in his student days, is just so far from being a master. He must have all his means perfectly at his command before he can freely express himself. Parkhurst, Daniel Burleigh. (1903) The Painter in Oils: A Complete Treatise on the Principles and Technique Necessary to the Painting of Pictures in Oil Colours.